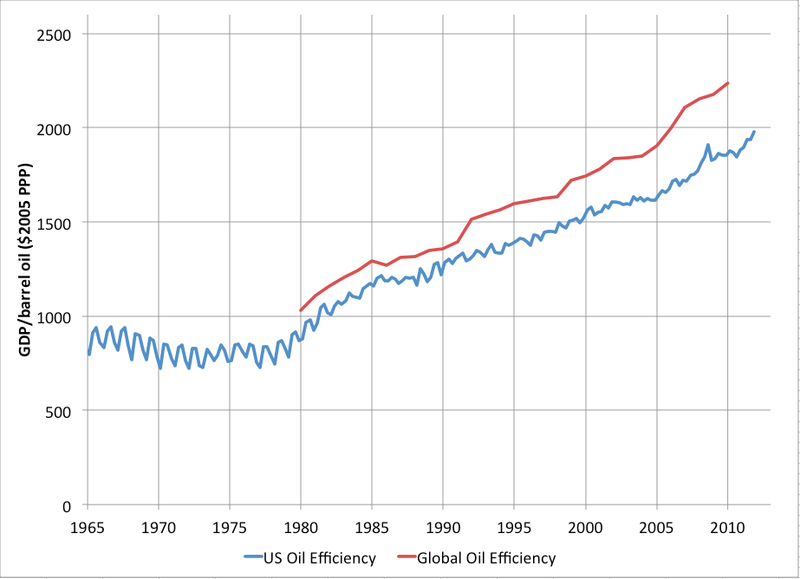 I posted a graph the other day showing the improvements in the oil efficiency of the US economy. Several commenters suggested this was due to increasing concentration of financial services in the economy, but that turned out not to be very consistent with the data. Another suggestion was that the improvement was an artifact of outsourcing the most energy intensive parts of manufacturing to other parts of the globe. To assess this I constructed a global measure of oil efficiency by taking the IMF estimates of global GDP (at purchasing power parity - adding the output of different countries as though identical goods and services were priced identically rather than using market exchange rates which can be heavily influenced by financial asset flows) and converting them to 2005 dollars using the BEA price indexes for GDP. I then divided this by global oil production (BP) to get the same kind of ratio of GDP/barrel. This only gets us annual data from 1980 to 2010 but it's enough for a comparison (above). You can see that the planet as a whole has been fairly consistently 10-15% more oil efficient than the US (unsurprising given the degree of sprawl in US cities and comparatively poor fuel economy in the US vehicle fleet). The trend in US and global efficiency are roughly comparable. So clearly the improvements in the US cannot mainly be a matter of exporting our problems elsewhere. You frequently see people (especially economists) claim that we are less dependent on oil because we use it more efficiently. This doesn't really follow. As a simple analogy, consider needing to commute 300 miles a week in a 10mpg SUV versus a 50mpg hybrid (non plug-in). Clearly in the hybrid case, we only need one fifth as much oil as in the SUV case. However, to make it comparable to the world situation, we have to also posit that in the second case only one fifth as much oil is available. This is because - although the world is now more oil efficient - it is using all the available supply. Then dependence is about our ability to handle a further shock - say a 10% reduction in supply. In the SUV case, a 10% reduction means we have only 27 gallons each week instead of 30. In the hybrid case, we only have 5.4 gallons instead of 6 gallons. However, in both cases we can only go 270 miles instead of 300, and therefore we aren't going to be able to get to work one day out of the week. In this sense, we are just as dependent in the hybrid as the SUV - we still can't go anywhere without oil. This is the correct way to model the situation because realistic oil shocks come in country-sized units. Oil shocks are generally caused by geopolitical issues within some particular country and the size of the shock is set by the fraction of global oil production currently produced by that country - whether it's Iran with about 4% of global oil production, or Libya with about 2%, to take examples of recent or current interest. Of course this doesn't mean we shouldn't become more oil efficient - we must. The worst case is trying to continue to drive the SUV on a fraction of the oil supply. That really won't work. What if oil just isn't that important an input to the faster-growing parts of the economy? Other people mentioned finance, but that also applies to healthcare, education, IT, and a lot of services. Oil is only really an input to a few sectors - plastics, chemicals, transportation, construction, agriculture, some others. But most oil-using transportation isn't really that important for GDP. People have to get to work, but how they get there isn't necessarily important to what they produce when they get there. Kjm: my main experience with "the faster growing parts of the economy" is Silicon Valley tech companies and I can report that it's very sprawly, that only a tiny minority bike or take public transit: the high fliers all drive thirsty BMWs, Porsches, Mercedes etc, and that if they couldn't get to work (or lunch), productivity would take a huge hit. If fuel prices double, buy a Prius (which will reduce fuel consumption by 50%). If Priuses are suddenly back-ordered (because everyone else has the same idea), put in your order and carpool with one other person (which will reduce fuel consumption by 50%) until it comes. If they double again, put in an order for a plug-in upgrade ($3,500 to $10k), and carpool in your Prius with one other person until it comes. If they double again, put in an order for a Volt and carpool in your plug-in Prius with one other person until it comes. When it arrives, sell your plug-in Prius and use the profits (because fuel efficient used cars will appreciate) to buy the Volt. If they double a fourth time(! ), rinse and repeat with a Leaf (or, if you like BMWs, Porsches, Mercedes, buy a Tesla). Your argument doesn't make sense when applied at scale. Since hybrids/plug-ins/electrics only have a few percent market share in the US, and since only O(10%) of the existing fleet turns over each year, it's only possible for considerably less than 1% of existing vehicles to convert in any given year. Increasing this capacity is dependent on manufacturors to retool on a large scale, and this would take a number of years. Therefore in a very severe and sudden oil shock, very few people could improve their situation by trading into such vehicles. Carpooling doesn't face this constraint, but there are nonetheless convenience costs - people have to align their schedules (requiring a fair amount of communication overhead), and also have to travel the additional distance to pick up carpool partners (or wait to be picked up). In the aggregate, these things will have some effect on productivity. In general, there's a reason why the short term price elasticity of gasoline is close to zero. I think the first line of defense in a very serious shock would probably be rationing (indeed the IEA exists in part to coordinate such plans) with a view to reducing less-essential travel on the part of the well off. There is another consideration in this kind of dollar-based comparison, and that is the value of inflation adjustments. The standard computations for inflation have been modified a number of times over roughly this same period, in each case with the result that inflation tended to be reported as being lower. If one believed that pre-1970 definitions of inflation more accurately reflected actual inflation and chose to use those values, then you would be dealing with markedly higher discount values. This would have the effect of reducing the slope of the GDP growth and, likewise, this measure of efficiency growth over that period. 1) car makers can expand hybrid/PHEV/EV production much more quickly than that: every maker is in the market, and they all have unutilized capacity. There is a likely bottleneck at some production level from their battery suppliers, but those too have been ramping up. In fact, the main anxiety in the industry is whether oil prices or public policy will produce sufficient demand for the investments. 2) Pareto's rule applies: a minority of drivers do the majority of driving. In particular, taxis. I believe that in Tokyo 2% of cars account for 20% of miles driven. 3) new vehicles are driven rather much than old ones: 50% of vehicle miles driven come from vehicles less than 6-7 years old. 4) the US has a large surplus of vehicles, and usage could switch from low-MPG vehicles to high-MPG vehicles. The classic example: dad is commuting in a Chevy Tahoe, and teenager is going on dates in a Corolla. If prices rise enough, dad can pull the Corolla back. He may find it humiliating to pull into the corporate lot in a compact car, but he can certainly get to work. Yes, carpooling isn't the favored choice of most drivers, but it is used more than mass transit: 10% of commuting is via carpool, vs much less for mass transit. Keep in mind that the classic carpool of 5 people isn't necessary: just one passenger cuts fuel consumption by 50% (or more, if they take the more efficient vehicle of the two). Modern telecom (including smartphone apps) ought to help a lot. Finally, sure, carpooling has a cost - but it's not big, and it would be temporary until your hybrid/EREV order came in. Regarding rationing: I seriously hope that price rationing is used: it's far more efficient. It gets fuel where it needs to go, and avoids endless nightmares of coupon distribution and waiting in line for fuel. If it is used, I hope it's very limited and used solely (as you say) to limit consumption somewhat by the well off - basically for PR purposes. We should help the working poor directly if needed (the earned income credit works very nicely, as do food stamps), not with incredibly indirect, inefficient, costly and bureaucratic rationiing. The reality is that the hybrid driver will have an easier time during a gas emergency, while the SUV driver will be lining up for hours and hours to fill up over and over. Gas isn't rationed based purely on how much is available - if you get to the gas pump, you fill up. Thus, a hybrid will perform better during an oil shock. Anyone who went through the oil shocks of the 1970s and '80s knows that people didn't miss work - they just spent all their spare time in gas lines. If gas wasn't at one gas station, it was at another - you just had to wait to be served. There's an article about hybrids in the current issue of BusinessWeek. The upshot: ICE vehicles are improving their MPG, and there isn't sufficient pressure from gas prices or public policy to raise hybrid market share. In fact, we have the same old story: increased efficiency is going as much to increased power as it is to increased MPG!!! We seriously need a fuel or carbon tax to internalize externalities, and plan for switching away from oil. Still, we are getting substantial efficiency gains, and that's better than nothing. Ian - you miss my point. I'm using the hybrid/SUV thing as an analogy to illustrate why the economy as a whole need not be less oil dependent because it's more oil efficient. That analogy helps show why "efficiency" is the wrong way to frame our transition away from oil. Moving to electric vehicles isn't efficiency, it's moving to better and cheaper substitutes. • 130 years ago, kerosene was needed for illumination, and then electric lighting made it obsolete. The whole oil industry was in trouble for a little while, until someone (Benz) came up the infernal combustion engine-powered horseless carriage. EVs were still better than these noisy, dirty contraptions, which were difficult and dangerous to start. Sadly, someone came up with the first step towards electrifying the ICE vehicle, the electric starter, and that managed to temporarily kill the EV. • 40 years ago oil was 20% of US electrical generation, and now it's less than .8%. • 40 years ago many homes in the US were heated with heating oil - the number has fallen by 75% since then. • 50% of oil consumption is for personal transportation - this could be reduced by 60% by moving from the average US vehicle to something Prius-like. It could be reduced by 90% by going to something Volt-like. It could be reduced 100% by going to something Leaf-like. These are all cost effective, scalable, and here right now. Oil has become more expensive than it's worth, what with it's various kinds of pollution, and it's enormous security and supply problems. "my main experience with "the faster growing parts of the economy" is Silicon Valley tech companies and I can report that it's very sprawly, that only a tiny minority bike or take public transit: the high fliers all drive thirsty BMWs, Porsches, Mercedes etc, and that if they couldn't get to work (or lunch), productivity would take a huge hit." Yes, but GDP doesn't measure how many *people* add up to x amount of GDP. One person driving an inefficient vehicle but producing $400,000 of product per year is much more efficient WRT petroleum use than 10 people driving motorcycles to work and producing $40,000/year in value. This is related to your other point, that lower-education men are losing more jobs. As the economy concentrates more on a smaller population, forcing those lower-income men to drive less because they don't have jobs, GDP can keep rising, while oil use declines WRT GDP. That seems to assume that the working poor are powerless to deal with gas prices. Oddly enough, used Priuses (45mMPG) and Honda Insights (65MPG) aren't much more expensive than much less efficient cars.